Almost unbelievably England has reached the semi-finals, and already the World Cup is hitting fever pitch. 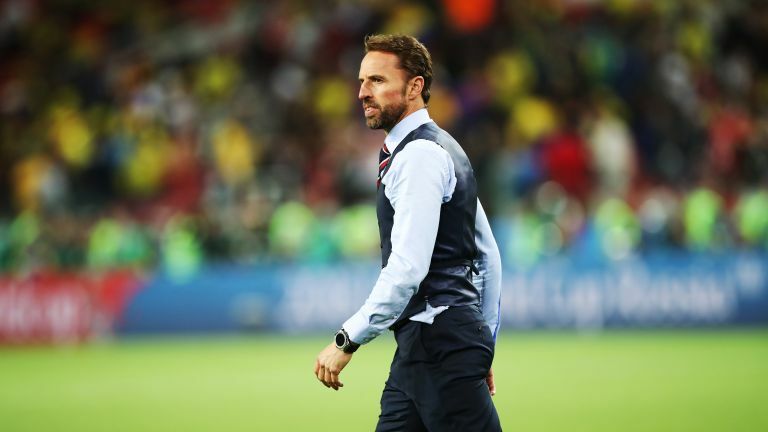 This year's tournament has been full of surprises, not least the fact that Gareth Southgate has become a style icon with a fine selection of waistcoats. Who could have predicted that the England manager’s style choices would set the internet alight? Not only does a waistcoat make a style statement (and flatter most physiques) – it’s also a highly practical garment. For one thing, it’s incredibly versatile: it keeps you warmer in the winter and, during the hottest summer action, you can remove your jacket and still stay looking eminently cool – as Southgate has beautifully demonstrated from the technical area. If you're looking for Southgate's exact outfit you'll be happy to know it's available from Marks & Spencer's official FA collection. The Navy Slim fit waistcoat is crafted from Merino wool, with heat fused 'Button Safe' technology, unique button detailing and jacquard lining. It's available from Marks & Spencer's website for £65. If you're looking for the full outfit, you can get the official 3-piece suit for £264, tailored-fit cotton shirt for £45, and silk tie for £25. One of the most common off-the-peg styles, the single-breasted waistcoat is a great go-to that suits everyone’s body shape. If you’re looking to customise your look, consider adding more buttons (or indeed, taking some away) from the conventional five-button style. For most body shapes, we’d recommend a pointed finish to the hem, as it elongates the torso, which has a flattering effect. With its mix of smart style and total wearability, it’s not surprising that Southgate has gone for this style to support his most important career endeavours to date. This is a more traditional option – perhaps better for autumn and winter, since it’s difficult to unbutton without looking a little messy. For a particularly formal occasion, the double-breasted waistcoat makes for an elegant and timeless look. Since the bottom hemline tends to be straight, not pointed, make sure that you try before you buy, to avoid any messy ‘shirt overhang’. The most striking style on offer, the horseshoe is the favoured option for very formal occasions. It lends itself really well to black tie, since it offers a modern alternative to the traditional cummerbund, which can feel cumbersome to wear. The deep opening also allows for showing off shirt studs, bibs and pleats, whilst covering the waistband of your trousers. Any bespoke waistcoat can feature a lapel and it’s a great choice for very warm weather, since it formalises your waistcoat to such an extent that you could easily go jacket-less and still look up to scratch. Lapels also offer lots of options to add your own style in a bespoke suit. You can experiment with colour, contrasting cloth and even add a signature stripe to make the look your own. The signature stripe is something we work with at King & Allen and involves having a few words or a phrase stitched into the cloth, much like a pinstripe. It’s picked up a lot of interest this week, thanks to a photoshopped meme of Southgate’s waistcoat saying ‘IT’S COMING HOME’. Sadly, it’s not real, but if England were to win the World Cup on 15th July then we think he’d have every right to get several full signature stripe suits made up in celebration! The cloth back isn’t to be confused with the traditional lining back – historically, lining was used as a practical solution as the back of the waistcoat was never intended to be seen. But, in modern formalwear, the cloth lining is coming into its own. Matching a cloth lining to the rest of the waistcoat is a really smart look, potentially eliminating the need for a jacket in hot weather. Whilst, in cold weather, the cloth adds an extra layer of robustness to keep you warm. For a statement piece, you could even contrast the cloth – but be careful, there’s a difference between statement and just plain odd! Choose a statement cloth: Tweeds, tartans, velvets, herringbone, brocade…the choice is endless, and don’t forget that your waistcoat doesn’t have to match your suit. Choosing a contrasting colour or pattern can enhance a suit no end. Would a union jack waistcoat be too much? One thing’s for sure, if anyone can carry it off, Southgate can right now.